At a first glance, Facebook Ads for hotels can be particularly tricky: your product will be at a slightly higher price point, and you’ll need to convince users to come all the way to you. Most Facebook Ads are run with two main strategies: target users (almost) anywhere to purchase or take actions online, or to target specific users who are nearby to stop in at your brick-and-mortar store. So what about hotels, who are targeting users everywhere to come see them in a specific place? 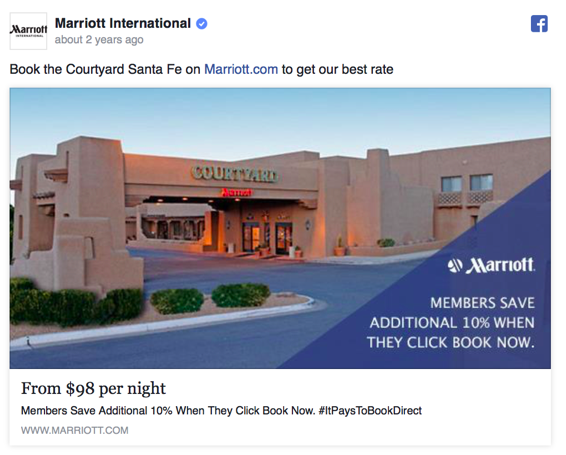 At a first glance, Facebook Ads for hotels can be particularly tricky: your product will be at a slightly higher price point, and you’ll need to convince users to come all the way to you. There is zero convenience involved in most cases. Despite the challenges, however, hotels and other businesses in the hospitality industry can drive significant results so long as you know how to run them. Abacus has successfully run numerous high-converting Facebook Ads for hotels, and now we’ll show you how, too. We’ve already addressed the challenges hotels will face when running Facebook Ads in the intro, but the benefits far outweigh them. Facebook Ads can give you the chance to show your resort to users in your target audience directly, instead of hoping they’ll find you when scrolling through Google results or Yelp. You also a few lines of text, and up to several images or a video to really sell what makes you unique; this is harder to do when you’re just one listing out of fifty on Travelocity. Running Facebook Ads for your hotel also gives you the chance to send highly targeted messages to specific audiences. A ski resort, for example, could use different ad campaigns for families than they would for a honeymooning couple. This allows you to sell your resort more effectively to every audience member who views your ad, increasing the number of bookings you’ll see as a result. Throughout all of this, you can use Facebook Ads to create offers and discount codes, enticing first-time visitors to convert and book a stay with you. Retargeting to past customers who have stayed with you once, especially near (but before) the one-year anniversary of their visit. Run campaigns based on relevant interests, behaviours, or income; households with higher income will likely have more ability to travel. There is also a “skiing, golfing, and boating” buyer profile under the “purchase behaviour” tab that could be ideal for luxury resorts. Target campaigns based on big events like birthdays or anniversaries, when people are more likely to travel away from home. Create campaigns for the “travel” behavior, including those who are looking for family vacations or those who are business travelers, or frequent travelers. Using carousel ads and videos to show multiple features of your hotel. If you had to choose just one picture to represent your hotel, could you? Probably, but wouldn’t you rather show multiple images? You can show the rooms, the hotel lobby, and the gorgeous, beach-side golf course. A great example of a video that does this well is the Facebook Ad from Disney of its Polynesian Resort below. They show several breathtaking views and go over plenty of reasons why viewers should want to book with them. It’s a fantastic introductory video. Use campaigns that feature UGC. User generated content can take plenty of forms; it can be a picture users took at your hotel, or a review they wrote. If you’ve gotten permission, share UGC in a Facebook Ad to increase trust and conversions. Users trust other customers more than your marketing department, after all. An easy way to do this is to pair the text from a customer view with a gorgeous image of your hotel. Run highly targeted campaigns. Targeting niche audiences with buyer personas is hands-down the best way to get top results with Facebook Ads. Focus on the different types of people who will be using different services your hotel offers. You can target women for spa weekend offers, for example, or engaged couples with ads for your wedding venues and honeymoon packages. A family vacation ad will look very different from a honeymoon vacation ad… if executed correctly. Promote a 360 view post. 360 view posts on Facebook will automatically capture a user’s interest just because it’s different. The format itself is a novelty. And when used correctly, you can use the 360 view to let viewers look around your hotel room, or the lobby, or the massive pool with fifteen slides your hotel prides itself on. 360 posts look impressive, but aren’t all that difficult to create; you can learn more here. Using dynamic ads for travel specifically instead of just regular dynamic ads can be very effective. They have the ability to target people based on search activity, give more relevant hotel recommendations based on factors like location proximity and rating, and show date-specific pricing. The result is they inspire people to research and book travel destinations, generate bookings and boost flights sales. Acquiring loyalty program members is also powerful since the top reason people book direct is because they’re a part of a loyalty program. Using lookalike targeting, you can find your next loyalty members based on your existing loyalty members. 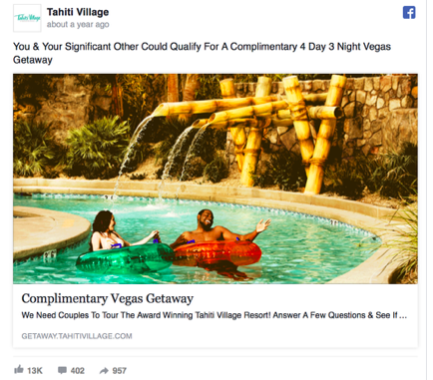 Running Facebook Ad campaigns for hotels can be slightly more challenging than campaigns in the e-commerce or retail industries, but the principles to success are still the same: know who to target, and how to win them over. Because we’ve been able to identify exactly how to do this, Abacus has had incredible success with each campaign run for hotels and resorts. As with all types of campaigns, understanding who your audience is and what they want is key to getting those conversions.